I hope you've been having a great weekend! Lots of things are going on this week, so I'm getting a jump start with MJ's TechnoStamper Sketch! It's a nice easy sketch this week, that I can see myself using many times. Here I kept the sketch as is, but I can also see rotating it for a different look. Have you seen the 2010 Spring Color Forecast? Pantone named Turquoise the 2010 color of the year. While my basecard isn't Turquoise, I used Teal, I do have some Turquoise in the DSP I selected to use with my image, and did add a bit of Turquiose in the coloring of my image. The beautiful vintage girl image is from the Hearts in Touch Valentine 2010 plate. She's stamped in Black Archival on White, then colored using the Walnut Tinting Technique from a past TJNL issue. The sentiment is from HIT's Valentine Extra plate. 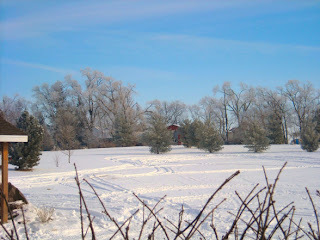 Like most parts of the US, it's been bitterly cold and snowy, this morning at 9AM it was -4, brrr! I do love when I have a chance to take a photo like this of my backyard though - the ice looks so beautiful on the trees. Later today I'll be posting my creations for the Creative Cuts and More Blog Hop, and tomorrow Kitchen Sink Stamps has some great new releases, be sure to stop back! I love Blue's, so I will surely enjoy 2010! 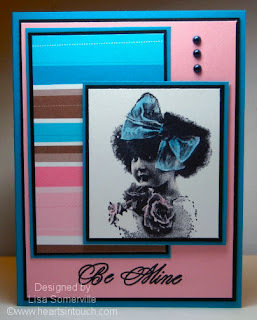 What a great stamp- at first glance i thought it was Kitchen Sink stamps......I love the BG paper- very nice-my colors. Have fun creating! Cute card! Love your color combos! Thanks for stopping by to leave a comment on my CC&M project! What a neat card, love the vibrant blues! Gorgeous card, Lisa! I'll have to look up that technique and give it a try! Thanks for the inspiration. I like your card Lisa. Great sketch. Oops, meant to say, great to see a photo of your backyard. Looks very very cold though. Love this adorable Valentine. I just love that vintage look and how upbeat it is with these fabulous colors. That image is fabulous. She is just adorable. I thought it was a Kitchen Sink stamp too. Super cool. Turquoise huh, one of my favorite colors. Thanks for playing along. Gotta love that little girl image with that huge bow...can't help but smile! Great interpretation of MJs sketch.....love the teals/turquoise colors!